Would you recommend Kittybot by Product Hunt to a friend? Umier Cabaguio Cruz has used this product for one year. @rrhoover Perfect timing for our latest topic: BOTS! @bentossell @rrhoover We are loving this topic too. 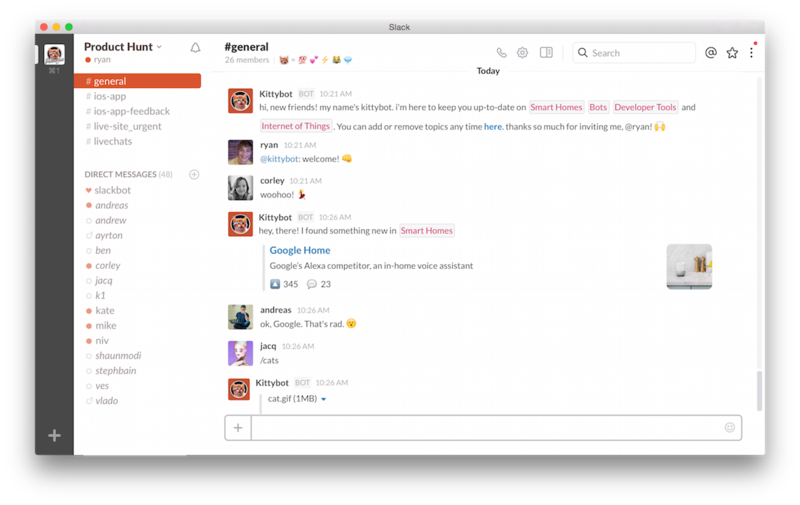 Totally converted to Slack and love integrations (and bots) that make it even more useful. @rrhoover @hellobrent Does this bot monitor for someone hunting your URL? That would be an amaaaazing feature for Kittybot! Product Hunt everywhere! And you get a Product Hunt bot, and you get a Product Hunt bot! @rrhoover @aditya_shirole definitely need to intro a /meow command ;-) Good stuff!